Home > 2012 > December > 30 > Special: "5 Gifts Any Blogger Would Love"
Special: "5 Gifts Any Blogger Would Love"
Interested in knowing what are five gifts you would love as a blogger? 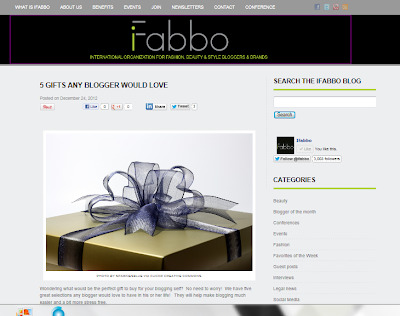 Check out an article I wrote for iFabbo: “5 Gifts Any Blogger Would Love” Happy Holidays, Everyone! read this web site, and I used to visit this website daily. Love your blog. Wanna follow each other?? Let me know. Great blog! Love your post! Normally I don’t learn article on blogs, but I wish to say that this write-up very pressured me to take a look at and do it! Your writing taste has been amazed me. Thank you, quite nice post. Hidee ho hot stuff! Awesome tip-thank you!